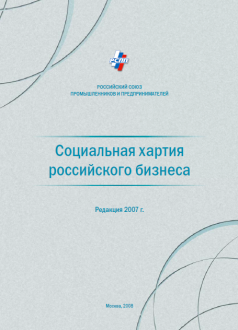 The Russian Business Social Charter was adopted by the RSPP Conference in 2004, and the new 2007 version was adopted in 2008. In 2007, the Social Charter was recognized as a national document that conforms to the UN Global Treaty. The Social Charter is a code of basic principles of socially responsible business practices, which are applicable to routine operations of any organization. • a new format for evaluating the joint contribution of business and its partners in the country’s sustainable development. Over 259 companies and organizations with 6 million employees have already joined the Russian Business Social Charter.